The Gibson made "Electric Bass" was its original moniker and it later evolved to be called the EB-1 when the EB-0 and EB-2 Models debuted in 1958. The EB was newly introduced back in 1953 and ceased production at the end of 1958 when the all-new Cherry Red, Solid Body, Double-Cutaway EB-0 model debuted, which was slated to be the EB-1 replacement. 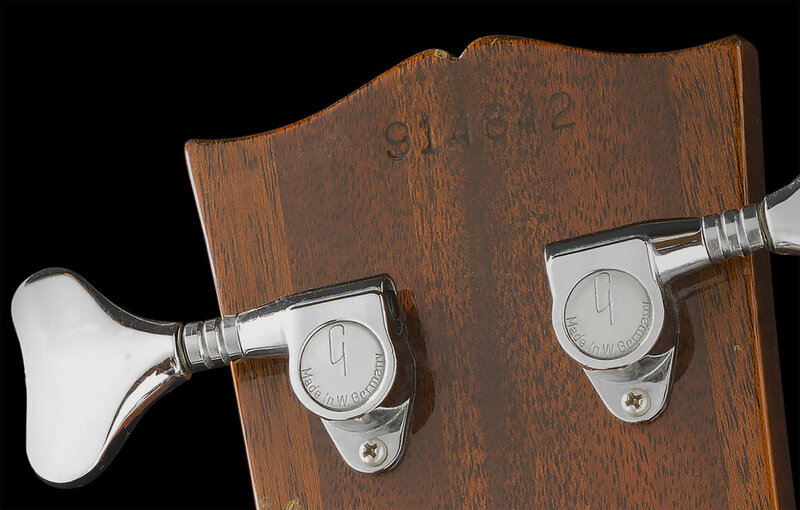 1958 saw many big changes in Gibson's product line with major model revisions as well as the introduction of several new and destined to become, iconic models. It was a big year at Gibson. 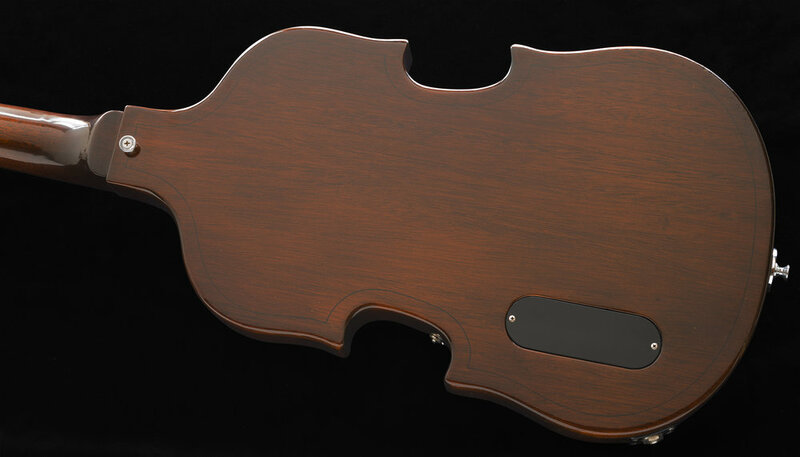 After a decade of absence from the lineup, Gibson reintroduced the Violin shaped EB-1 in 1969 as a "reissue." This new model had an approximate 4-year production run that tapered off after 2 years and barely lasted until 1972. There were under 500 units shipped during this entire period. on the 1950's models as well as most all of these Reissues, although it morphed from a front and back "double stripe" to a front and back single stripe on the reissues. Additionally, Gibson elected to omit the faux painted on F-Holes that adorned the 1950's models. I have examined, tested, serviced and set-up this instrument and found it to be factory-correct and unmolested in every way. All of the electronics, frets, nut, tuners, finish and both the plastic and chrome plated metal hardware are Correct and Original to the Bass. This bass was very sparingly played long ago and then stored by me until today. Globally, the bass displays some minor marks and a few small dents, but there are no major cosmetic or structural issues to notate. The back of the body has some minor impressions in the finish, but it's all minimal. 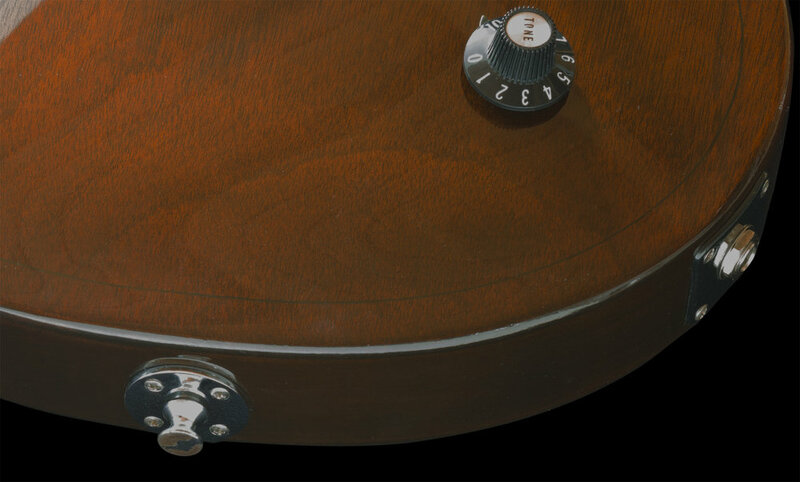 Keeping true to its 1950's predecessor, Gibson included an adjustable leg pin that screws into the receptacle located at the bottom of the bass, where the strap button resides, however, the Leg is missing from this example and NOT included. Nonetheless, I have had some opportunity to try these basses with a Leg installed in the past on other EB-1 basses and I have to say, in my opinion, that it has No practical usage. The CASE is Original to the Bass and is also in matching, excellent condition with a functioning handle, latches, and hinges. The interior compartment lid is missing the plastic snap on straps. The STRINGS needed to be changed and it has just been set-up using a Brand New set of D'addario XL, Nickel round wounds. I originally purchased this bass for my collection, it was about 25 years ago and I have had it safely stored ever since. I already had a 1950's example and I wanted the modern reissue version too but was having trouble locating a clean, collectible condition specimen until I stumbled upon this stunning example. Growing up, discovering and learning to play bass in the late 1960's exposed me to Rock players who made the Gibson bass sound popular. I was influenced by the music and the bands whose bassists sported them. I was particularly drawn to Felix Pappalardi whose playing still inspires me today. His trailblazing, melodic approach and musical style, coupled with a raucous sound were unique as he played in a heavy but "lyrical" way, which I felt nicely complemented Leslie's gutsy vocals and equally muscular, straight-ahead guitar parts and sounds. I always felt that Felix "prettied" up Mountain's music a bit with his melodic approach on the tunes where it was appropriate, but he did it with a brutal, fat and somewhat distorted, huge tone (a wall of Sunn Amps helped). I often feel that the melodic parts that Felix created versus the TONE he used was a bit of a dichotomy and I think this is partially what drew me in to notice him. Felix also played with a Pick, although it didn't seem to add much definition and you'd never know it by listening. He was a unique player and a multi-talented musician on many levels and I still enjoy listening to him today! If you might be interested in acquiring a clean and original condition example of this model, this bass may appeal to You, so please inquire. Weight: 9 lbs. 7.6 oz.